LG V30 to sport an f/1.6 lens, the widest aperture ever on a smartphone camera! Smartphone cameras are getting better each year, and the quality of the optics remains the one thing that really distinguishes a true top of the line flagship from a mid-range ‘flagship killer’. Each smartphone company try to gain an advantage by making their offerings look better on paper. The initial fight was by increasing the megapixel count each year. Since the last couple of years, it’s the aperture. Samsung introduced smartphones sporting lenses with aperture as wide as f/1.9, and LG outwitted them with LG G4 which had an f/1.8 aperture. From 2016 till now, f/1.7 was the widest aperture lens used, and LG is set to overtake Samsung once again at least in this regard. The camera war has seen close fight between LG, Samsung and Apple over the recent years, and LG will be incorporating a couple of changes to edge out the tough competitions. LG’s upcoming flagship smartphone, the V30, will be the first smartphone to sport an f/1.6 lens. 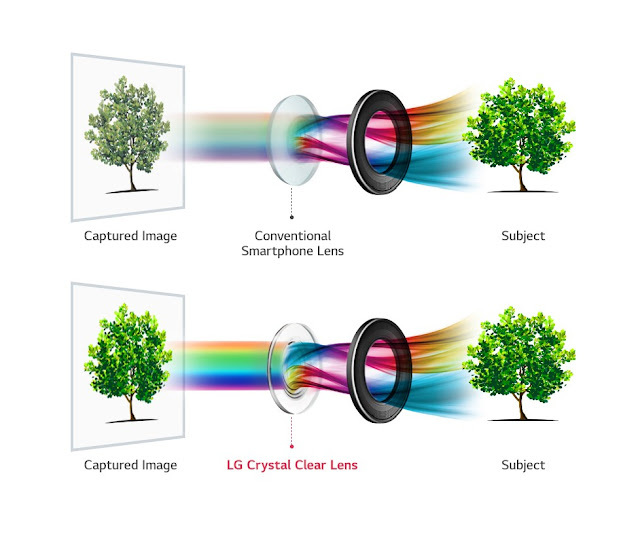 Another change that LG will bring out is inclusion of a glass lens with higher clarity than the existing ones. Touting it as a combination of ‘largest aperture and clearest lens ever to be featured in a smartphone’, LG looks determined to deliver the best smartphone camera till date! The wide f/1.6 aperture will allow 25 percent more light to hit the sensor compared to an f/1.8 lens. The Crystal Clear Lens enhances the color reproduction and also the ability to gather light compared to a plastic lens. As it is evident in the illustration shown in the above image, more accurate colors can be captured. The overall gain makes the V30 well suited for photography and videography. At least on paper, the V30 is an improvement over the previous flagships from the company, and it might well be better than other OEMs’ flagships too. The camera in V30 is said to cut edge distortions by a third compared to the V20 in wide angle shots, thus making it ideal for expansive landscapes or large group photos. Although the optics of V30 includes so many improvements, the camera module still remains sleek, at a size that’s almost 30 percent smaller compared to the module used in V20. Along with other features in LG’s cameras such as laser detection auto focus, optical and electronic image stabilization, the LG V30 might runaway with many best smartphone camera awards this year.